Adventurer, Explorer, Entrepreneur and Padma Shri Award Winner . Is the first Indian to have completed the Polar Trilogy comprising skiing to the North Pole, South Pole and across the Greenland Icecap. 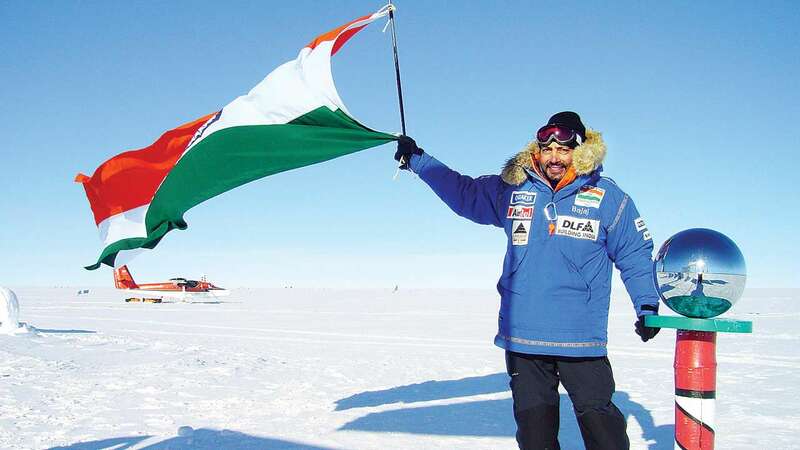 Ajeet Bajaj, an adventurer and explorer, is the first Indian to have completed the Polar Trilogy comprising skiing to the North Pole, South Pole and across the Greenland Icecap. With over 30 years of experience in adventure sports, he is the first Asian to have rafted and kayaked some of the most challenging rivers in the world spanning six continents. Ajeet won a bronze medal in the National games for kayaking and a silver and two bronze medals in international rafting championships in Switzerland and Russia. In April 2006, Ajeet became the first Indian to ski to the North Pole. In 2012, Ajeet Bajaj was conferred the Padma Shri by the President of India. He has also been felicitated with the Hall Of Fame award by the Adventure Tour Operators Association of India (ATOAI) for his contribution to the growth of adventure tourism in India. He has also been felicitated with the Hall Of Fame award by the Adventure Tour Operators’ Association of India (ATOAI) for his contribution to the growth of adventure tourism in India. Ajeet is a Fellow of the Aspen Global Leadership Network and Fellow, Royal Geographical Society. Winning in a changing environment.